It was a whirlwind 5 days at my first artist residency this past week. Lots of great art completed and some terrific students and staff! This is the project that Kindergarten completed. I was inspired by this post by Art with Mr. Giannetto. I feel in love with the presentation, night with a moon. I changed it around a bit and this is my version. This is a 2 - 3 session project depending on your students. Using my 12" x 12" hardboard as a guide I cut out an owl body and crescent moon for each student ahead of time out of corrugated cardboard. I do this ahead of time. We work on wax or newspaper. I gave each student a piece of Model Magic, about the size of a plum. We talked about wing shapes and each student made 2 wings for their owl. By having the cardboard owl in front of them they can gauge how it will look. After forming their wings they add some texture to them with the tools. Set aside when done. Give each 2 - 4 students a little plate with some drywall filler. Using their hands they spread the drywall covering the owl on the front. The kids then add some texture to the drywall. I have a bin full of tools, things like combs, lego pieces, plastic canvas, etc. One of the best tools for the owl is a plastic spoon. You can make feather shapes on the belly of your owl. Both the owl and wings will need to dry overnight. Hand out the 12"X12" boards. Using black acrylic, paint the front of the board. 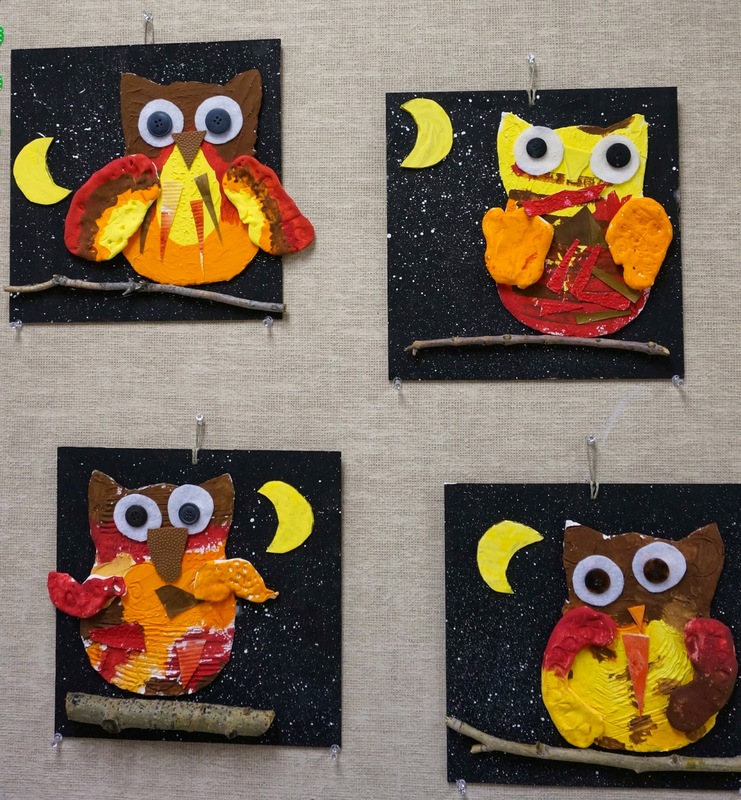 Using acrylic paint in Fall colours paint your owl body and wings. 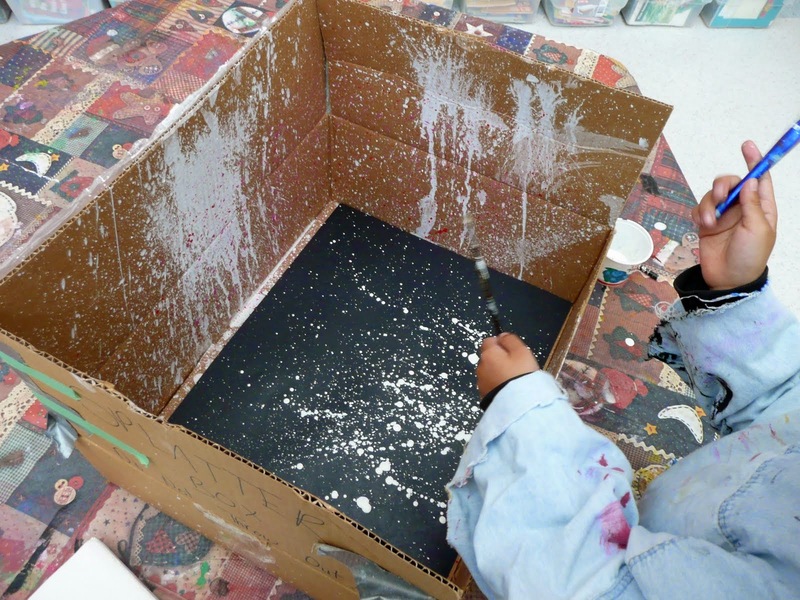 Paint the cardboard crescent moon as well. Set a side to dry. Now it's time to splatter. I have a big cardboard box that I use. It has "Splatter Box Do Not Throw Out" in big letters written on it so I don't accidentally lose it. Place the black painted board into box. Using white acrylic paint with a little water mixed in to thin it a bit, splatter some stars onto your board. I have found that old toothbrushes are the best splatter tools. You dip the brush into the paint and then just run your finger over the bristles. At school the splatter station is running at the same time as the kids are painting. Make sure the kids reach down into the box. Now it's time to glue. Using the glue gun, set up a parent volunteer or just have the kids visit you at your glue gun. Glue on the owl body and the twig to the board. The kids can glue the wings and the moon on themselves. While I was working the glue gun I had the kids glue on the eyes. We used a white felt circle and a black button. The beak was a triangle cut from some textured craft foam I had. You could just use some paper. I also brought in some extra painted paper I had left over from some other projects. I always keep leftover painted paper for my stash. The students cut out some extra feathers from this paper and glued them to the body while they waited for their turn to get their owl glued. Here are some of the Kinder owls. See you soon with more residency projects. This is such a great idea. Perfect for Kinders!